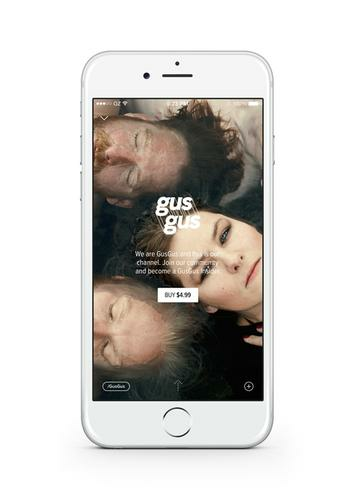 The Icelandic band GusGus will offer a channel on Oz. Would you pay to watch your favorite band go on a road trip? Or shell out five dollars for a short film series, with a new installment each week? Oz will host that content, and charge you for it. The company will launch on Thursday a new video platform to let up-and-coming artists, small businesses and even journalists publish videos online, gather metrics about their performance, and charge viewers to watch. The Iceland-based company wants to help those sorts of people make money -- ideally earn a living -- from their work at a time when practically anything can be gotten online for free. Oz videos will be accessible on the Web as well as on iOS and Android. Premium or exclusive content will be the focus. So instead of album tracks from a band, you might get live outtakes, or exclusive interviews from the studio, or footage from a road trip. Many of today's free, ad-supported services -- like YouTube or Spotify -- operate like a buffet, whereby users can freely pick what they want, but nothing is one-of-a-kind, said Gudjon Mar Gudjonsson, Oz's founder and CEO. Oz, he said, is like a boutique restaurant. He might be right. Oz's site looks polished, like a classier version of YouTube. With roughly 30 employees at launch, Oz is more than 10 years in the making; the first prototype of Oz's service was developed in 2004. And Gudjonsson is no stranger to the tech industry, having played key roles in the development of European telecommunications companies like Magnet Networks and Industria. The questions is whether Oz can attract enough viewers for its video producers to make good money. The site will let artists and businesses create custom channels for showcasing their videos, and set their own monthly fee for viewers to access the content. The minimum charge will be $1.99 per month, though Oz is recommending most channel creators charge around $5 per month. Oz videos can be created and accessed globally, and will support payments in 120 different currencies. The company takes a 30 percent cut of producers' revenue. For video producers who can build a following, the payout seems enticing. By charging $5 monthly, 1,000 monthly subscribers could generate $42,000 in gross annual revenue for a channel creator, Oz says. Oz is likely to face big challenges attracting viewers, as other online services look to provide their own exclusive entertainment content. Tidal, Jay Z's new paid music streaming service, is placing an emphasis on exclusive content, as well as its "artist-owned" status. Apple, meanwhile, is reportedly angling for rights to exclusive content for its planned Beats service. YouTube itself is also developing its own paid subscription offering. But Oz is not just about music. Journalists can use it to fund ongoing projects, as can teachers who want to deliver lessons online, Gudjonsson said. Fuel TV, the action sports network, will operate a channel. It's basically for any person or group who wants to make money from digital videos online, Gudjonsson said. Troy Wenham, an independent artist from Wales, said he has begun developing animated short films that he might publish through Oz. He said he might publish content on Oz, but if it doesn't perform well, put it on YouTube. For now, musicians are a focus of Oz's outreach efforts. Icelandic bands like Samaris, Retro Stefson and GusGus will create channels on Oz. Gudjonsoon declined to comment on whether Bjork or Sigur Ros, two Iceland bands popular overseas, would create channels. Creators can embed their channels onto their own websites, so viewers do not necessarily have to visit Oz's site to access the videos. Oz videos will also include a tool to create "Moments" -- short clips that can be shared and watched for free on social media sites like Facebook and Twitter. Oz hopes to make its videos more discoverable this way. The company is holding a launch party on Thursday in Los Angeles, where it is in the early stages of planning another office. Because, while Oz's headquarters will remain in Reykjavik, Iceland, "the home of creators in the physical world," Gudjonsson said, "is Los Angeles."